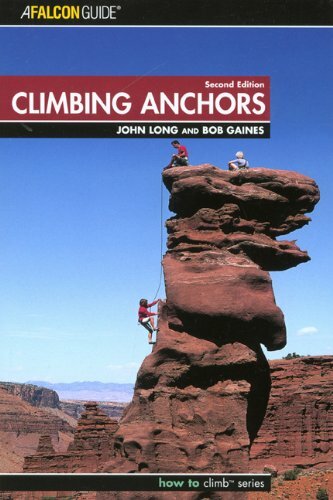 Climbing Anchors, 2nd Edition (How to Climb Series) by John Long and Bob Gaines is one of two recommended books (the other is Rock Climbing Anchors: A Comprehensive Guide by Craig Luebben) for any climber who is interested in setting up rock climbing anchors. Although this book won’t replace training from a class or an experienced climber, it will explain a lot about rock climbing anchors in plain English. Whether you’re new to building anchors or you’ve been climbing for years, you need this book! Climbing Anchors describes how to use natural anchors like trees and blocks, passive chocks like nuts and hexes, mechanical chocks like cams, and fixed gear like pitons, bolts, and webbing. The book then goes on to describe how fall forces are involved, how to judge the direction of pull, and the knots for anchoring. Finally, Climbing Anchors explains anchor systems including SRENE (Solid, Redundant, Equalized, and No Extension), belay anchors, toprope anchors, rappel anchors, bivouac anchors, and big wall anchors. Anyone who climbs outside of the gym would probably benefit from reading this book. Need to build a toprope anchor? This book covers it. Need to place pro? This book covers it. What knots to use? This book covers it. What gear to buy? This book covers it. The best part is that this book covers all of these complicated topics without ever becoming hard to read. If you enjoy technical discussions you will likely find this book interesting even if the specific topic being discussed is not something you can apply directly to your climbing. New climbers or experienced climbers interested in extending their knowledge will find this book very helpful. Not only will you learn how to build anchors but you will also learn why they need to be built the way they are. As long as you don’t think this book will be a replacement for an anchor-building lesson from a school or an experienced climber you will likely be satisfied with Climbing Anchors. The fundamentals of building safe and efficient anchors are covered in the right amount of detail to get you climbing without overwhelming. Outdoor climbers, you need a copy of Climbing Anchors!